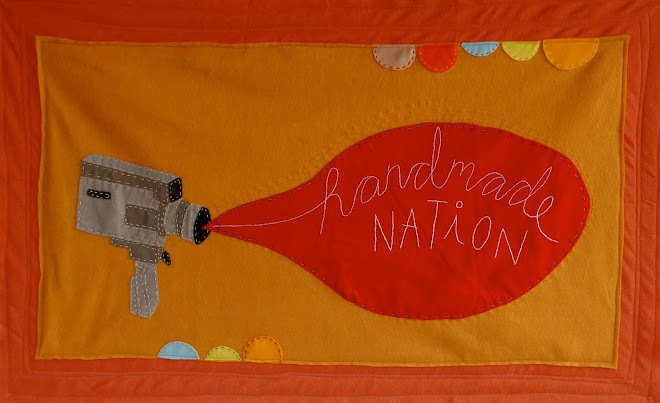 This past week I was interviewed by the lovely Sister Diane aka Diane Gilleland of CraftyPod.com It will mark my very first podcast interview ever (yay, thanks Sister Diane), which I suppose is something to mark down in the books along with being on TV and Radio. The interview was really very nice balance of business and casual discussion about the Documentary. I think it will go live (is that the correct term with a podcast?!) sometime in April, I will of course let you know when that happens! I was very proud, I didn't swear once. "Pass It On! Connecting Contemporary Do-It-Yourself Culture"
From their site: "DIY is an exhibition that will be on display at A+D Gallery of Columbia College, Chicago IL in Spring 2007. This site represents a space to discuss ideas about the exhibition and Do-it-Yourself concepts in culture and history." I will be making a story board of sorts on the film that will be a part of the show. I'll post pictures on the flickr account when it's done. This is a pretty complex graph from their site that reminds me of a big ol' text book, it's mapping out the DIY Landscape, really you should just check out the site. So remember, this week is etsy updates. I'll post pictures when the new work goes live an don't forget about our t-shirt and tote sale, a bunch are left at the $12 price (except women's american apparel mediums, those are gone). Had a bit of trouble accessing this account for a day or so! The merge of google and Blogger and all my emails is getting insane! But I figured it out and all is well. In other documentary news, we are shooting around Milwaukee over the next few weeks. We will be visiting some craft groups in town, sewing classes, our neighbors Fasten Clothing Coop and doing an interview with designers extraordinaire The Little Friends of Printmaking. Don't forget we will be in Pittsburgh for Craft Congress which is quickly approaching.... March?! More news & pictures soon!